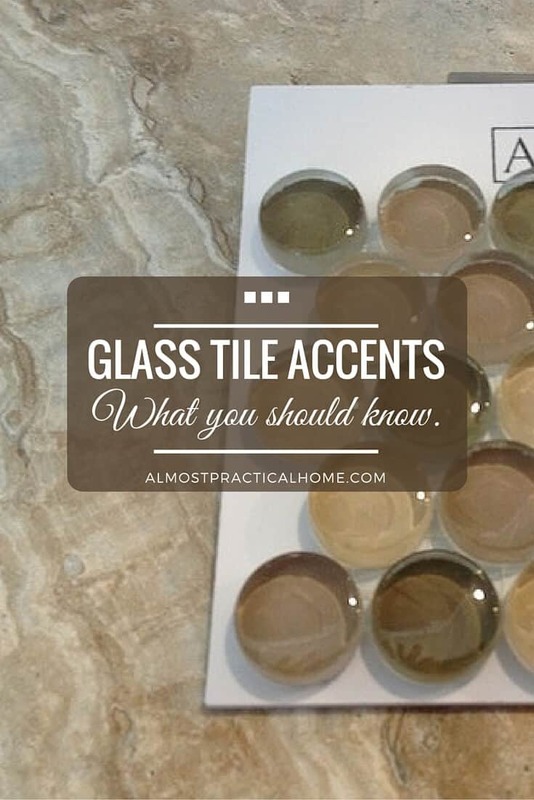 Bathroom Tile Accents - One thing about using glass tiles. When we were looking for bathroom tile accents in our recent remodel, we decided to go with glass tiles. They came out looking great but there was one thing that I was not aware of. Something I wish I knew before I chose the tiles that I ultimately decided to use. Glass tiles were kind of the “new” thing when we did our remodel (New because I haven’t used them before). For the overall bathroom, I decided to go with neutral colors. I wanted a timeless look because I know that I won’t redo the bathroom for quite some time. Neutral colors are great for longevity, but they can be kind of boring. So using some bathroom tile accents seemed to be a good way to add a little pizzaz without going overboard with patterns and color. How high should wainscoting in the bathroom be? Overall for this bathroom, I used warm, natural tones. The shower is a cream colored subway tile. 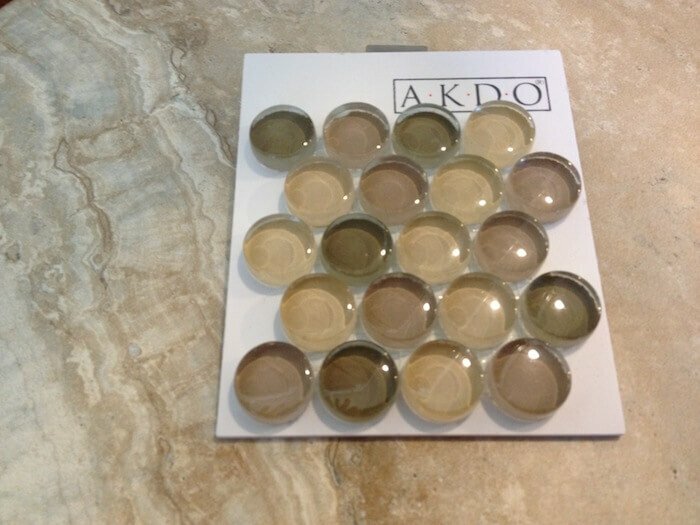 This tile in the floor and tub surround has a lot of variation in it but it picks up on the cream color as well as some almond tones. Given the warm colors of the rest of the bathroom, I felt that the glass tile accent pictured above would fit the space perfectly. The glass is penny round and the colors incorporate an olive, sand, and rose color glass. These are some of my favorite muted shades all put together. I was really excited to see them on the wall. However, things don’t always turn out the way you expect. When my amazing tile guy installed these bathroom tile accents, they didn’t look the way that I thought they would. What I didn’t realize – and what no one told me, is that the glass will appear much darker when tiled in. 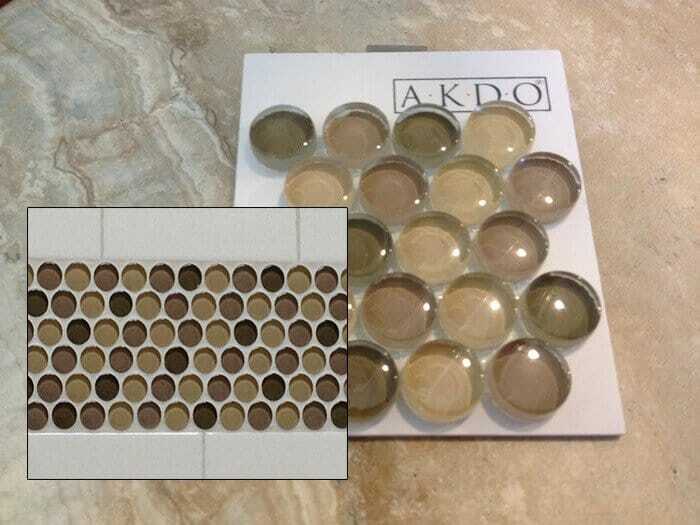 It makes sense because the sample is not grouted and the light gets in and around each individual tile. Glass, being glass, allows that light to pass through. So, those soft shades of olive, gold, and sand actually appear like brown, taupe, and beige – as pictured in the image below. Much darker, don’t you think? Now I am not saying that this effect will happen to everyone, as I do not have much experience with glass tiles. But it something to keep in mind if you take on a big remodeling project. Certainly, it worth asking about when you purchase your tile. Many tile stores have samples that are already grouted in. Compare the ungrouted sample to the grouted one to get a feel for what it will look like on the wall. 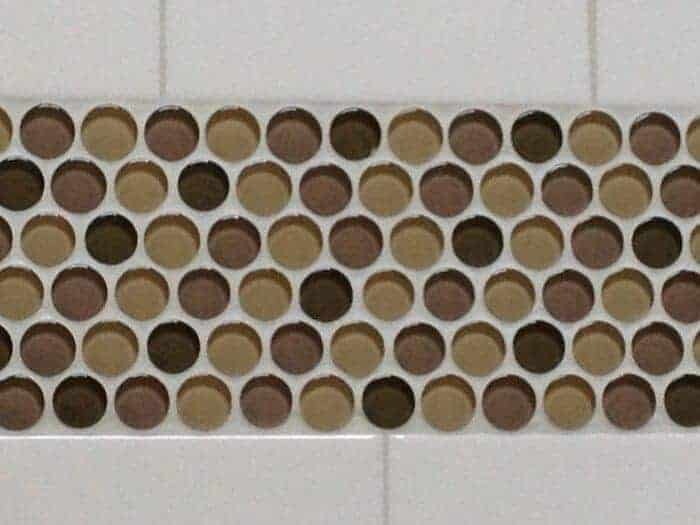 And if they don’t have your particular color choice already grouted, then they might have a different color sample in the same pattern that is grouted. Take a close look at this to see how the colors change, and then try to imagine what your choice would look like. 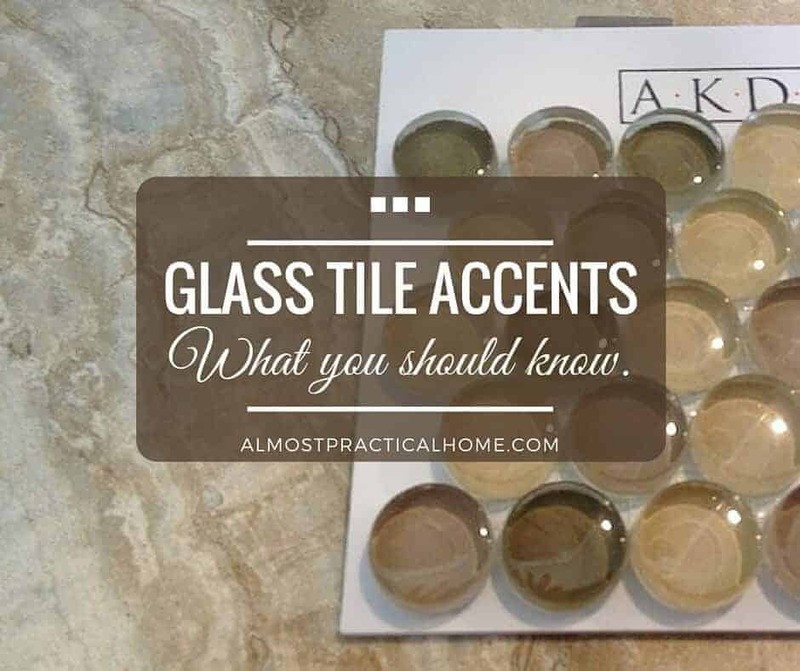 Have You Used Glass Tile Accents? In my experience, glass tile accents appear darker once they are grouted on the wall than they do in the ungrouted sample. So, I want to know if you have had the same experience as I did. Leave a comment below and tell me if your bathroom tile accents came out looking the way that you thought they would. Share what you learned. See how we handled the tricky issue of having a window in the shower in this post. Did your tiler use glass tile (whiter) adhesive behind the glass tiles? I caught that in our shower just in time! I haven’t posted about it yet, but it’s in the plans…. Thank you for bringing this to our attention. I chose iridescent glass tiles with colors of copper, mother of peal, and brown. I chose a darker grout thinking it would match the most of the tiles and fade away. Now it only makes sense that the color will change against a dark grout. I did more research and found that there is specific mortar for glass tiles. Thanks so much for the heads up! !